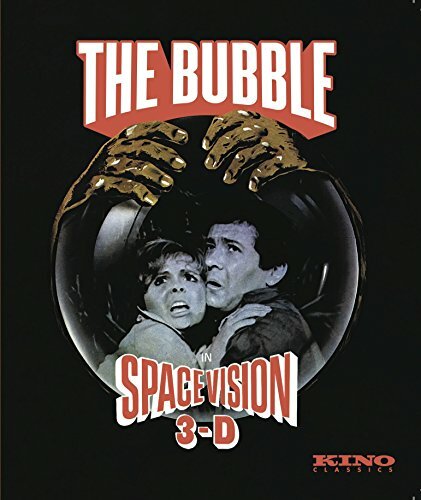 THE BUBBLE is the ""eerie and enjoyable"" (Los Angeles Times) science-fiction spine-tingler that shocked audiences and revolutionized the cinematic world of 3-D! The eye-popping thrills and chills begin when a plane carrying pregnant Catherine (Deborah Walley) and her husband Mark (Michael Cole) is forced to land in a mysterious remote town. The townspeople are quite strange, indeed: they repeat certain phrases and movements ceaselessly and stagger through the streets like brain-dead automatons. Then there is an even more terrifying discovery - the zombie inhabitants live under an impenetrable dome, trapped like insects in a jar. Can Catherine, Mark and their newborn baby escape The Bubble, or will they become mindless drones trapped in a human zoo? THE BUBBLE introduced the ground-breaking Space-Vision 3-D system, which pioneered a new way of both shooting and exhibiting 3-D film. These single-strip 35mm stereoscopic techniques were used in almost all major 3-D features for the next thirty years, making THE BUBBLE not only an ""amazing"" (Hollywood Reporter) sci-fi thriller, but also an important milestone in the history of cinema. Now fully restored from the 35mm negatives by the 3-D Film Archive.